If you already have linked that domain, i think it needs to be confirmed. Please note that external domains are not compatible with SSL feture (https) since Forumotion cannot deal with external domains because they can't access them. From what I have learned the past 8hrs, dannyworld.....no. That depends, if already have one linked, it will remain free with no expirary unless you delete it or dont renew the domain with whoever you bought it with. If do not have it linked yet or ever delete it then, no, you will have to buy the advanced pack to link it. @TonnyKamper wrote: I would like to know since I use an external domain name, which doesn't expire for another 2,5 years on my forum if it's still possible to keep that on the free service, or am I forced to go back to the original creation url ? Would it still be possible to disable ads on the free package by purchasing credits for that purpose? That's not very clear to me yet..
be careful, what you say is totally wrong! we do not delete anything from your forums! what is in place before the implementation of the packages we do not touch it and will remain as it is. if you have already installed an external domain via CNAME on your forum before packages update, now that the packages are in place, as long as your CNAME is still active, it will not change anything for you even if you are in a free package that does not include an external domain. however, if you delete the current CNAME and want to set up a new one, you will need to be in a package allowing it. @The Godfather wrote: be careful, what you say is totally wrong! we do not delete anything from your forums! what is in place before the implementation of the packages we do not touch it and will remain as it is. 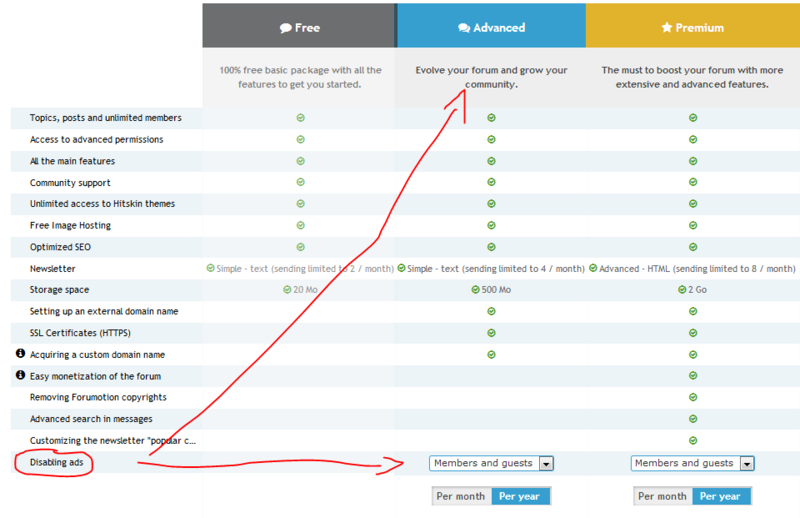 you will have to buy the Advanced package to remove your ad's from your forum every month or year. if you already have ad's removed. Please remember this may change for each member as I have other things I have added before the package system come out . Thank you very much for claryfying that to me @APE one last question, would it still be possible to pay for that via the Skrill system? Because we don't have a paypal account..
@TonnyKamper wrote: Thank you very much for claryfying that to me @APE one last question, would it still be possible to pay for that via the Skrill system? Because we don't have a paypal account..
@TonnyKamper as the godfather has said already if you pay for one year then the system will let you use all the ways you did before to pay for your credits. and 2 months free as well Great deal if you ask me. Yes I understand money is hard to come by and you don't make money on your site but the good thing is we run contests here on the support forum so that will give you a chance to win some credits too. A few months ago I bought enough credits to disable ads for members and guests until 2022 but now it says they're only disabled until 2019. Have I lost those credits now? Can the ads now only be disabled for a year at a time? As brandon_g will confirm, I have problems with credits appearing in my admin panel and have to go through private message with him to give the head office a nudge to sort it out ....which is why I bought a few years' worth last time so I didn't need to keep bothering him. @APE wrote: @TonnyKamper as the godfather has said already if you pay for one year then the system will let you use all the ways you did before to pay for your credits. Oh I didn't knew that about the contests @APE can you give me a clue as to where I can find those contests here? @jkh As far as I knew you could only buy one year at a time before this change but I could have been wrong as I have never been told any other way. The problem is our new system will only let you buy a pack for one year and the system is made to take what you have already and then change to a pack system after that. So it looks like it may have just removed your ones you have already paid for and set it to one year only. If that's the case then you will need to talk to brandon about him talking to the head office about this or maybe if I tag @"The Godfather he can help you more on this matter. Lets just see if The godfather makes a reply tomorrow before we make a report. @jkh Please can you make sure you edit the post you just made and add your URL to it so we know what forum you are talking about. If you want to know more about how to take part on contests Please drop me a line in a PM and I will be happy to tell you all about what we do. Please Note this is not the place to talk about the contests thou its about the update at this time. @jkh wrote: A few months ago I bought enough credits to disable ads for members and guests until 2022 but now it says they're only disabled until 2019. You said that you bought credits, but did you spend them? Yes I did spend them. Keep calm, you cannot lose any single credit. - Be refunded the same way for copyright disabling and SSL certificate if you bought some of those features. Please note there's an issue on current expiration date ! Unfortunately yes. You cannot have an expiration date greater than 14 months : 12 months for package and you can renew up to 60 days before expiration date. @APE wrote: @jkh As far as I knew you could only buy one year at a time before this change but I could have been wrong as I have never been told any other way. That was the case for domain name (why pay for several years since the domain might be offered for free by Forumotion) and SSL certificate. But before the packages update, it was possible to add one year of ads and/or copyright removal as many times we could afford. First off, as an active forum with 400,000 messages and being a forum with you guys going on 7 years now, I absolutely hate these changes. No excuses will fix that. If I wanted other services I'd have paid for them, now I have to pay more for extra things that do absolutely nothing for me. Secondly, my Chrome browser is up to date, and yet your panel is broken. EDIT: Fixed! Thirdly, forumotion previously "offered" me my domain name for free. Are you telling me that I'm now going to have to start paying for it? You want me to more than DOUBLE my costs and tell me to be ok with it? Quite frankly I'd leave your service if you didn't have my forum in a stranglehold with your No forum migration rules. I agree with the rest though, we're in the same boat. Now we have to pay 4x as much as before and we are stuck on forumotion (in my case the German version), because we don't want to give up almost 36000 posts. For your second point, just press Ctrl+F5. It should be fine after that. For your third point, there is no change for offered domain names. As long as a forum meets the requirements, it will be still offered, even for those running on free package. For the first point, i can tell you nearly everybody hates these changes. And i am pretty sure Forumotion hates to need to do that even more than we do. But since 2004 things have changed a lot out there. So with all these changes the deal is very clear ! Change or die. And personally, i prefer not to die now. What about you ? No, i'm not happy with those price increasing, i dont think you will find a single founder happy there, but i'm still happier than all those founders who had to say to their members they have to stop because their hoster told them they would stop all their activities. 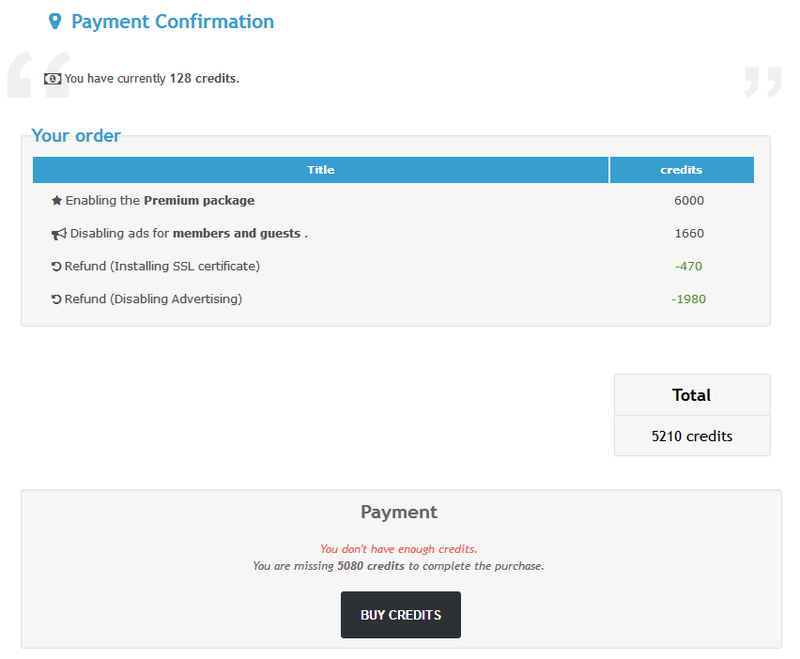 I paid for 1000 credits in USD, and then purchased the premium package and it did not use my credits. It charged me 9.60 USD instead of using my credits. I would like a refund or something. I was under the impression it would use my credits before charging me. 1. Why can't the contribution link be brought back so that members can help buy the credits instead of leaving it up to the forum owner to finance the forum which is for their benefit aswell? 2. Are unused credits carried over to the next year or do you lose them if you don't use them? For instance, if all I want to buy is another SSL certificate then I would need to buy the premium package which leaves quite a few credits. I don't need to buy things like a domain name, extra storage or disabling of the forumotion copyright, and I don't want to monetize my forum, so all I would need is the SSL and ads removal...so what would happen to all the remaining credits? 3. If I buy the premium package (because I want to disable the ads) do I get unlimited credits to buy everything on that list or is there a limit to what I can choose? Good point about the donation link. We can activate the link in the admin panel, but there are only payment methods most user probably never heard of. Could there be Paypal added? 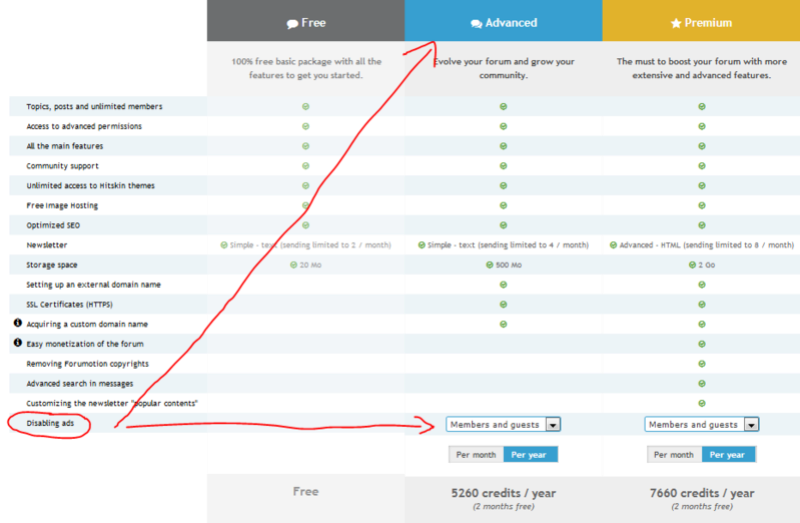 @Chellizard wrote: I paid for 1000 credits in USD, and then purchased the premium package and it did not use my credits. It charged me 9.60 USD instead of using my credits. I would like a refund or something. I was under the impression it would use my credits before charging me. If it charged you in USD instead of credits, means you chose a monthly package and in that case it's paid via Paypal. @jkh wrote: 1. 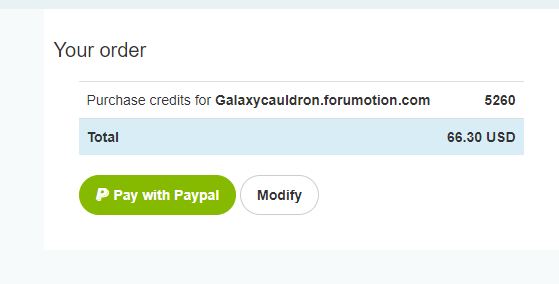 Why can't the contribution link be brought back so that members can help buy the credits instead of leaving it up to the forum owner to finance the forum which is for their benefit aswell? There is no unused credits. You pay for a pack, regardless of what you use inside it. Like a triple play offer where you can get phone, TV and Internet. And no refund if you dont use the IPTV feature. Just check my previous answer ! If you buy premium package just to disable ads, i would tell you that you're wasting your money. You need only an advanced package to remove ads. If you choose premium package u can activate all items with no extra fee, except internal domain name which is charged 1200 credits. Of course you will be refunded for features you hadn't used yet ! So if I buy the premium package now but don't use all the credits, will those remaining credits carry over to the second year or do I lose them? Please.do not answer questions if you're not staff.